In the last iteration of how to train your python, we covered the concept of control flow and covered the booleans associated with it. Today, we'll be putting those to use as we discuss how to use if, else, and how to make conditional statements. So, Let's get started! These are just some simple conditional statements to be used as examples, we should have a good grasp of conditional statements by carrying over what we learned in the last article. So now that we've covered conditional statements, let's get to if and else! There we go! Our if and else works like a charm! 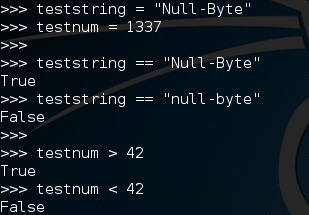 If the user inputs Null-Byte, it responds differently than anything else. There it is! Our elif statement caught that we entered incybernews after it passed through our initial if statement! The reason behind using elif instead of more if's is because you can only have one if and one else, but you can have as many elif's as you need. We'll use this if we have to test for many different conditions at once. Make your own if/elif/else blocks! Try and incorporate what we've covered up till now in this series in your code! Remember to leave your resulting code in the comments below! Well, there we have it. If, elif, and else. These are some of things we'll use the most frequently throughout our scripting careers. Make sure to come back and join us for the next iteration of how to train your python! Very good series, I like the way you explain and makes things kinda simpler. As someone who has been over the basics and some modules already, I cannot wait to read the more advanced lessons to come. Hope you have a nice day,watcher. Again going through your tutorial with the raw_input function not being the same as it was in its functionality is leading to an inability to complete the exercise . I understand the concept but it would be nice to be able to apply the knowledge first hand and see it work so I know for sure I have it right. Thank you for your knowledge.